Edmund Freeman, one of the Ten Men from Saugus and the founder of Sandwich is buried here with his wife Elizabeth. Freeman settled on his homestead about a mile and a quarter east of the present Town Hall on the sloping land leading from what is now Tupper Road down to the Cape Cod Canal. (Most of the former Freeman land is now occupied by the NRG power plant.) They lived out their lives here and when Elizabeth passed away on February 14, 1676, Edmond buried her on a hill on their farm. 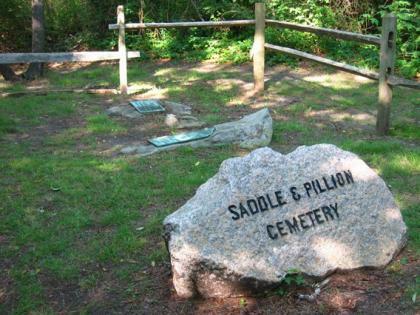 He marked her grave with a large stone likening to a pillion (a British term for the seat behind the saddle on a horse). With foresight, Edmond also positioned a large stone that resembled a saddle to be used as a monument for his own grave. Family tradition tells us that the headstones reminded Edmund of the early years in Sandwich when he and Elizabeth traveled by horseback over the fields of their farm. Edmund Freeman died in 1682 and was buried beside Elizabeth, the longer stone, “the saddle,” was placed over his grave. At one time these graves were encircled by a stone fence, remnants of which were still visible in the late 1800’s. The beautiful bronze tablets which are presently on these stone monuments were placed there on August 22, 1910 by members of the Freeman family, descendants of Edmund. This entry was posted in Cemeteries, Early Settlers. Bookmark the permalink.